Sharing a new area in our home with you today. It’s the breakfast nook/dining area off of our kitchen. It’s a well used and well loved spot that we use multiple times a day and it’s also where we have our family dinners each night. Design decisions in our house always take function into mind. This particular spot needed a bit of privacy and we found the perfect solution. 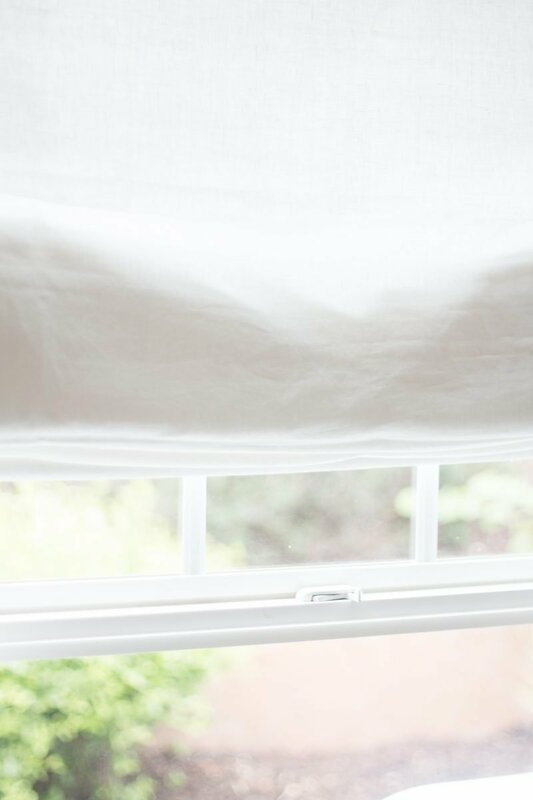 Excited to share our new Roman shades with you thanks to Barn & Willow. There is also a discount code below if you are interested in new window treatments. Gasp. We actually took some shutters off of our windows. I know. Seems aggressive and crazy. Let me explain. So we only took them off of these two windows and will keep them in case we change our mind years from now. This particular situation was a bit tricky. We are planting trees in our backyard to give us privacy from another home. Until those grow, the top third of these windows don’t allow for privacy. BUT we LOVE natural light. 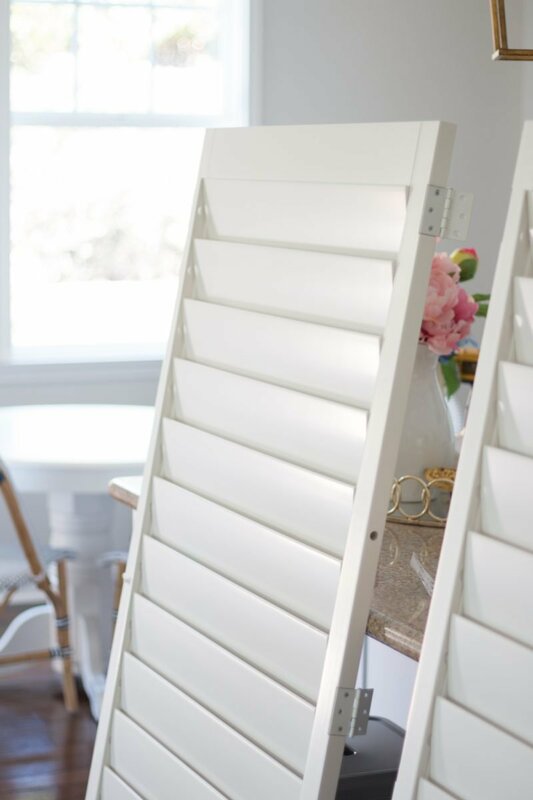 With shutters, it’s pretty much all or nothing. They are either open or closed. So the natural solution was to hang something on the top third of the windows and that’s where Barn & Willow comes in. When they reached out to me I was thrilled because this was on our short list. Not easy to see because the sun was shining in, but high on a hill is another home and I really just need privacy versus blocking any light. I told my friends from Barn & Willow exactly that and she said I needed privacy lining. Umm! Yes!!! That’s ideal. 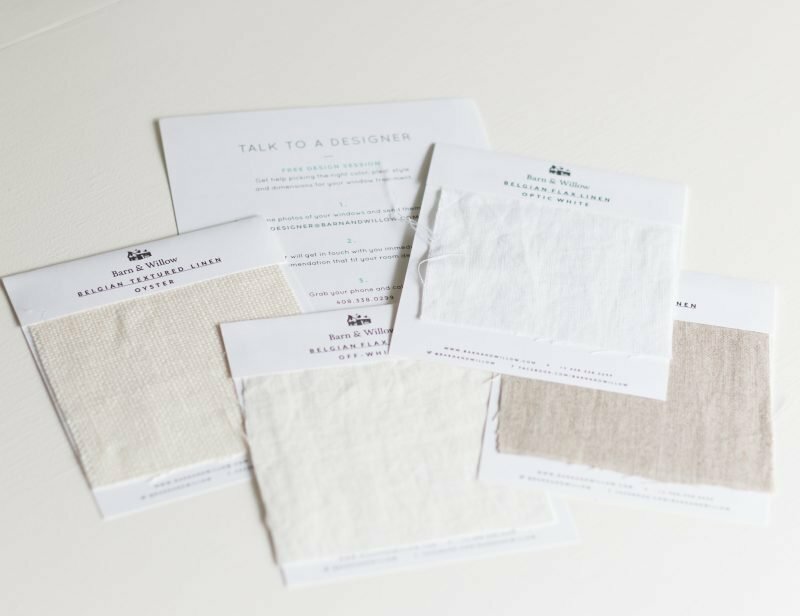 So shortly after that discussion we received free samples in the mail of the different fabric choices. It was a no brainer for us and immediately we both picked the Belgian Flax Linen in Optic White. So pretty. 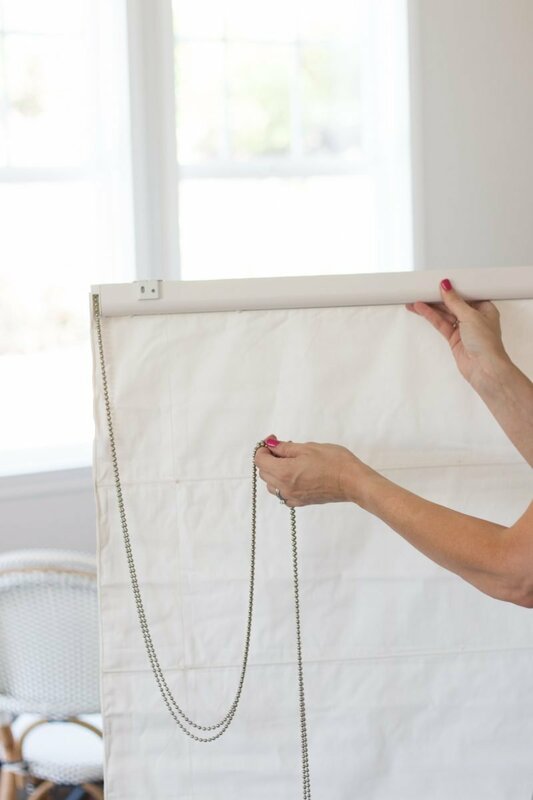 I had never had custom Roman shades made before and Barn & Willow made it a very simple process. You can also speak with a designer and I especially appreciated the detailed instructions on measuring correctly for each shade. Here is a peek at the back of the shades. So well made and beautifully lined. The attachment if very simple. Two brackets get attached to the wall (you can choose inside or outside mount) and then they snap into place. 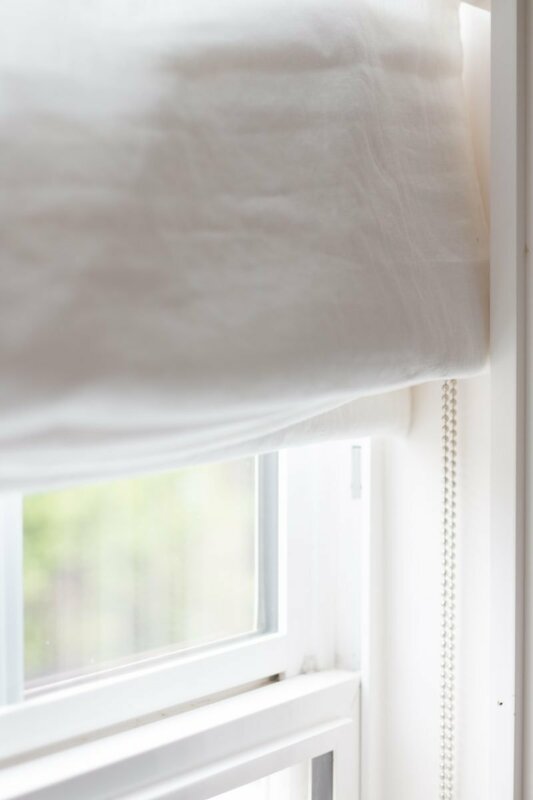 All of their window coverings are made from natural fabrics like Belgian linen. And by easy to install, I mean that my handy husband had no trouble. LOL. While I do know how to use the drill I just feel like he does a better job. (And perhaps I am lazy. Shhh). We are seriously in love. 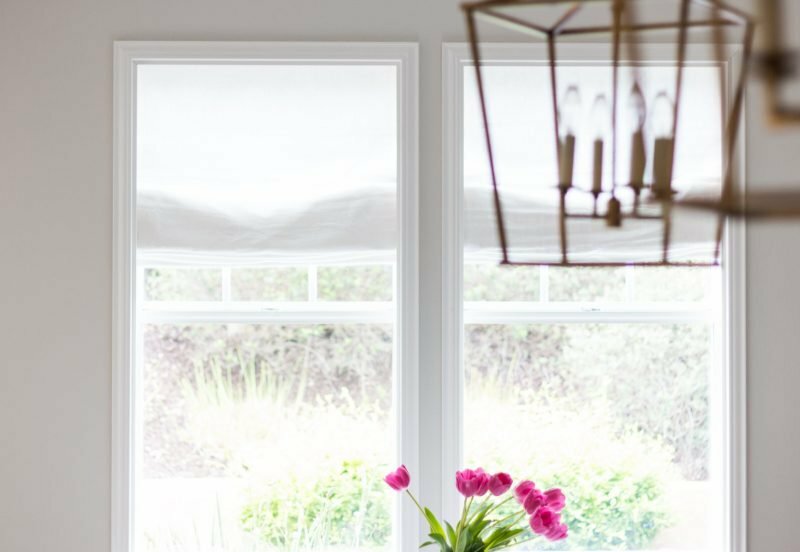 These privacy lined shades are exactly what we needed. Now we still have a pretty green view, all the privacy we need and the sun can pour in. These chairs have been on my wish list for years and I finally pulled the trigger during the Memorial Day sales. 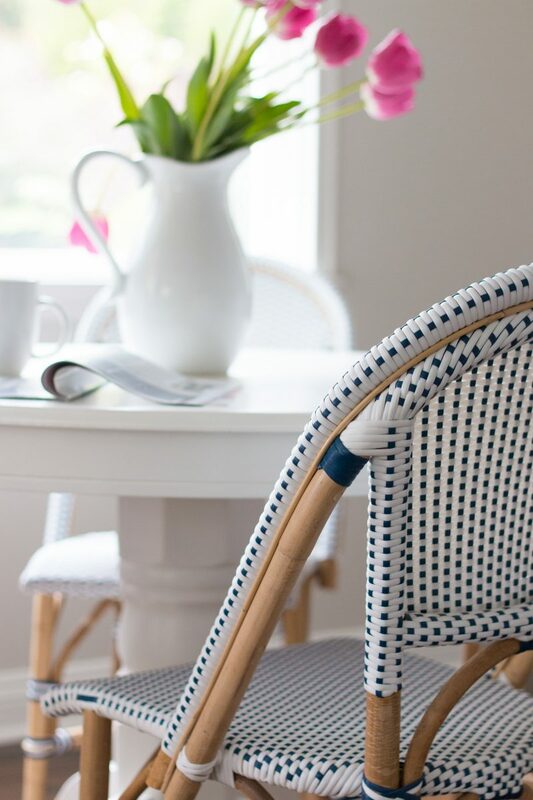 They remind me of the bistro chairs have seen in our favorite cities during travels over the years. I think they pair well with our newly painted white table. It’s the pedastal table we picked up from an antique store over 13 years ago. This table has seen many nightly dinners over the years. Tips on how I painted this table are found here. These chairs have been on my wish list for years and I finally pulled the trigger during the Memorial Day sales. 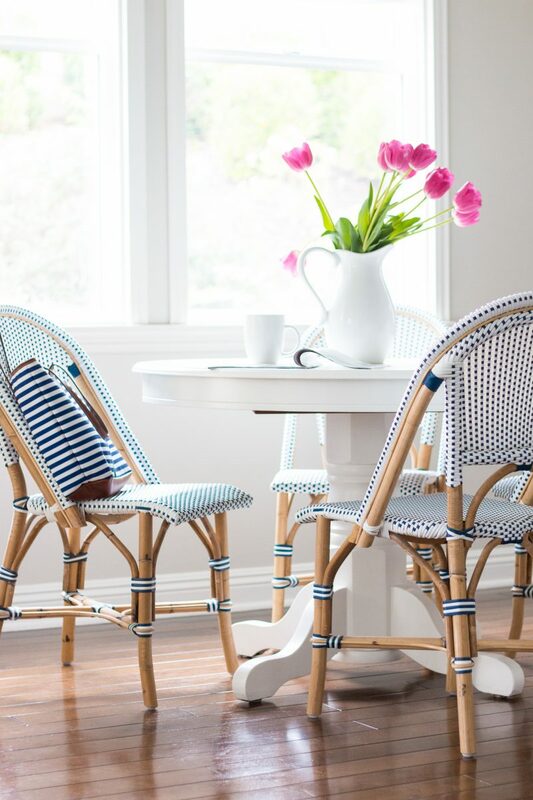 They remind me of the bistro chairs have seen in our favorite cities during travels over the years. I think they pair well with our newly painted white table. It’s the pedastal table we picked up from an antique store over 13 years ago. This table has seen many nightly dinners over the years. After the kiddos go back to school next week, I know this will be a spot where I sit down with my laptop to get some work done. I love how light and bright it is. Right now, my striped tote has everything house related while we work on projects here and there. I like to keep track of what we are spending as well as contact information for any resources we use. Keeping that all organized is something I learned from my sister. And having just sold a house where we needed to list every tiny upgrade we did, it’s nice to have it all logged in a spreadsheet from the very beginning so you don’t have to rely on memory. Not my strong suit. I also include tear sheets for inspiration in my home improvement binder. I went with the flat Roman Shades and I just love they way they sit in the windows. And adding some fabric really helped to soften this area. The wall color is Pale Oak by Benjamin Moore. The cord is so easy to use and is a nice substantial weight. The quality is definitely there and when you are raising or lowering the shades, they just feel good. So that’s a peek into our daily dining space. This will be the spot where over one million bowls of cereal are eaten if your children are anything like mine! And I am grateful for each barefoot, pajama wearing morning they give me. 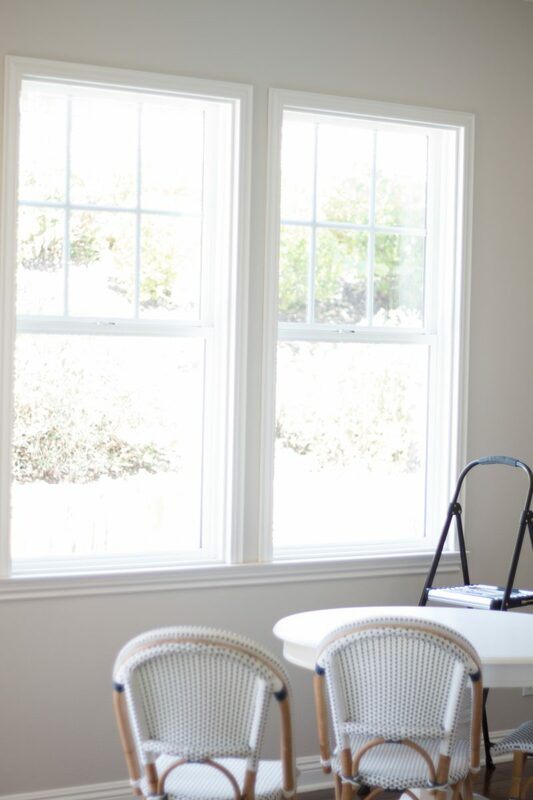 If you need any type of Roman Shade or drapery, you may want to check out Barn & Willow. They are offering a discount code to my readers, too. Thank you, Barn & Willow. Details below. 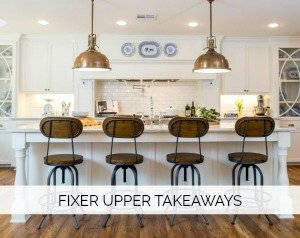 To see more of our kitchen renovation go here. *Thank you to Barn & Willow for partnering with me on this post. I love your new chairs! They have been on my list for a while, and still are! 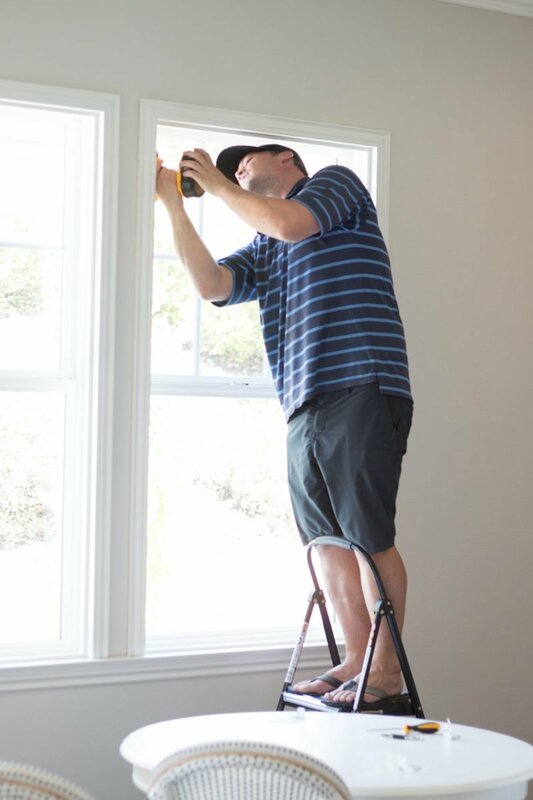 Please let me know what type of paint you have used on your walls and trim. I am wondering if egg shell and semi gloss were your choices. Thanks! 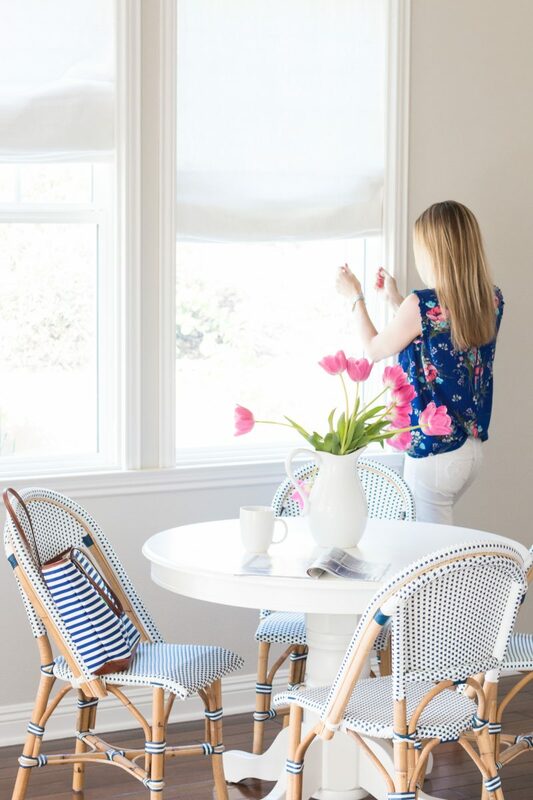 Love the classic shades and those chairs are gorgeous! 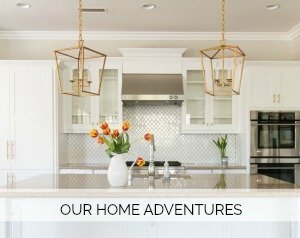 I am loving watching the transformation of your home! Can you please tell me the diameter of your table? I just want to get a sense of the scale of your table with the chairs. Thanks!! They are perfect! 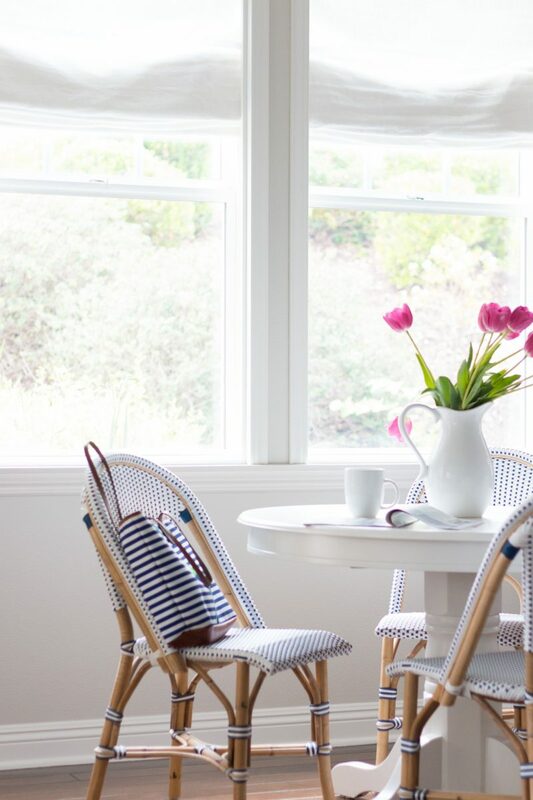 And, I am loving your pretty white table and those fabulous chairs!! Looking forward to seeing more of your beautiful new home. Not the point of this post but I love that shirt so much! They look wonderful and I love those chairs too. Have you thought about having a piece of glass custom cut for your table? I find it works out so much better with young children and not getting scratched or really dirty. Just a thought! Can you share the diameter of your table?? Curious if you think a setting for four feels big enough for everyday use?? Thanks! !